knock knock... what's for dinner? Most of LG’s Tuesday morning was given over to ooh-and-ah displays of its big, beautiful, super-thin (as skinny as 2.5mm), Ultra-HD OLED TVs, but we’ve all seen really large, expensive TV sets displaying vibrant images. 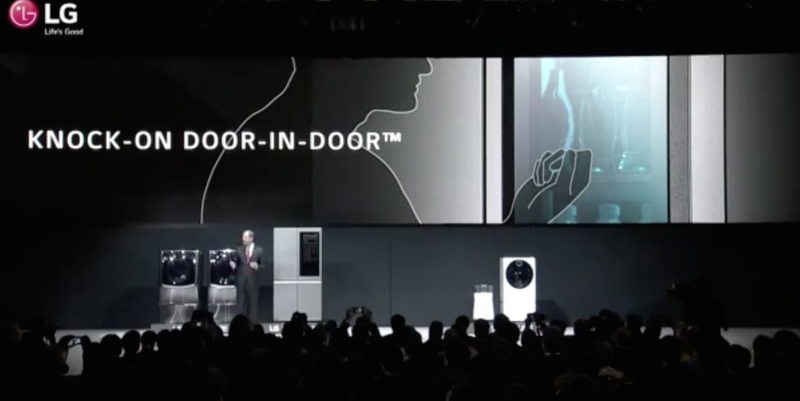 The company’s more novel innovations were shown off during the tail-end of the event, when LG showed off its new line of premium appliances. 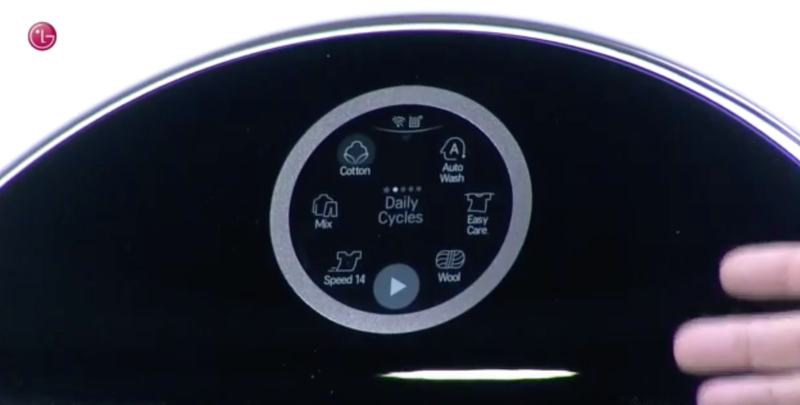 For instance, there was the LG Signature washing machine that does away with the standard panel of buttons and dials and puts all the controls on the glass window. 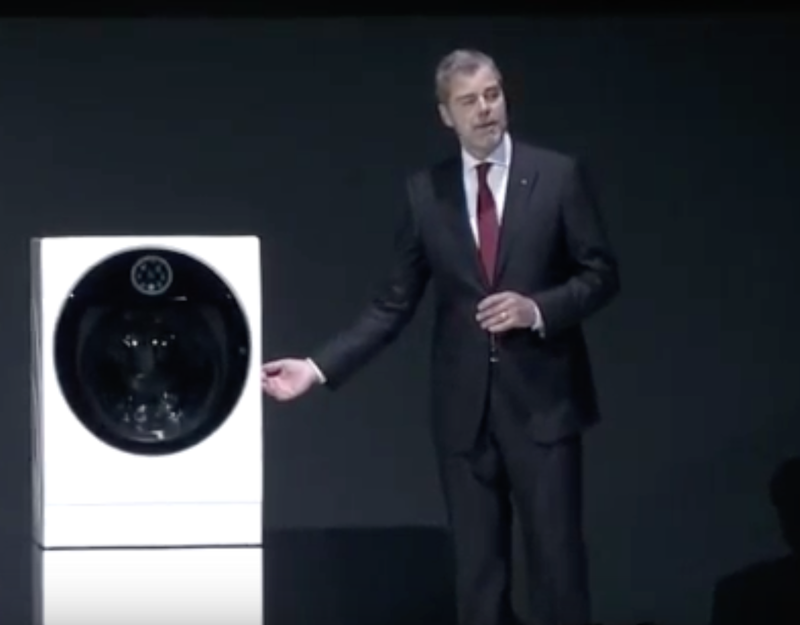 And not only does this machine retain the in-the-pedestal mini-washer that LG introduced at last year’s CES, this version is also a combination washer/dryer. According to LG, the machine’s drying function requires half the electricity of a traditional electric clothes dryer. Another cool idea with this washer: push-to-open. So if your arms are full of laundry — or maybe you’re talking on your phone and trying to load the washer at the same time — you can just push the door in and it will open; no having to put anything down to pull the handle. Speaking of easy-open, the new LG Signature fridge features two interesting innovations. 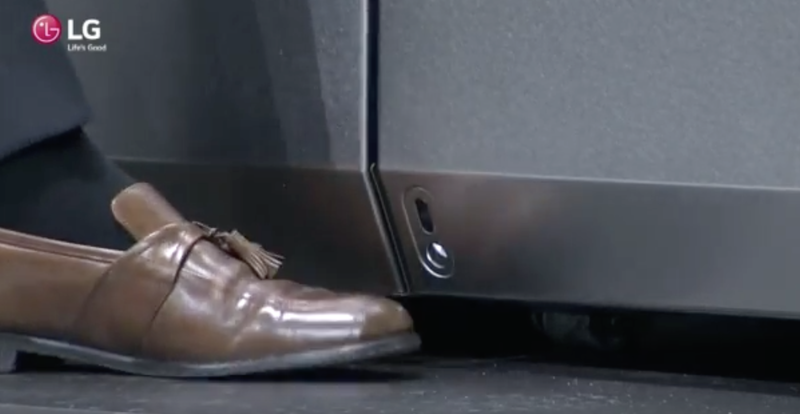 The first is a floor-level sensor that allows people to use their feet to tell the refrigerator to open the door. LG claims that a nosy pet won’t trigger the sensor, but we’ll believe that when we see it. Then finally there’s the fridge door with a panel that turns transparent and lights up when you knock on it. Want to see if there’s milk, or if the butter is running low? Just knock and — assuming what you’re looking for is visible through that panel — you’ll know without having to open it. The fridge also comes with an interior clad in stainless steel, which doesn’t just look rad, but which LG claims will better moderate the inside temperature. As mentioned at the top, LG did spend an awful lot of time showing off its new Ultra-HD OLED TVs, so we might as well give you some more information on those. The company is showing eight new models of these next-gen sets, which feature thinner displays and deeper blacks than the LED and LCD screens most people are used to. The screens range from 55″ to 77″. By housing the TVs’ circuitry in its base, LG has gotten these OLED sets down to 2.57mm (.1″) thick. LG compares that to the thickness of a few credit cards stacked together. The speakers are housed in a forward-facing soundbar that either sits below the screen. According to LG, this provides a more robust sonic experience compared to the downward-facing speakers found in most skinny TVs. Of course, if you’re splashing out the money for a 77″ OLED set, what are the odds that you’re just using the speakers that come with the TV?